Who in the world doesn’t love fried potatoes for breakfast? I love them, and posted about my mom’s breakfast-style hash last Christmas. Since the Elimination Diet is not really carb-o-rific I, of course, have been wanting to eat some. I decided the best way to beat back a food-want is to make them and eat them and be done with them. The best way to eat potatoes is fried of course. In a french fry to be specific. But not today. Today’s potatoes are along the same lines of the breakfast hash that my mom makes but zinged up with homemade taco seasoning. De-lish. 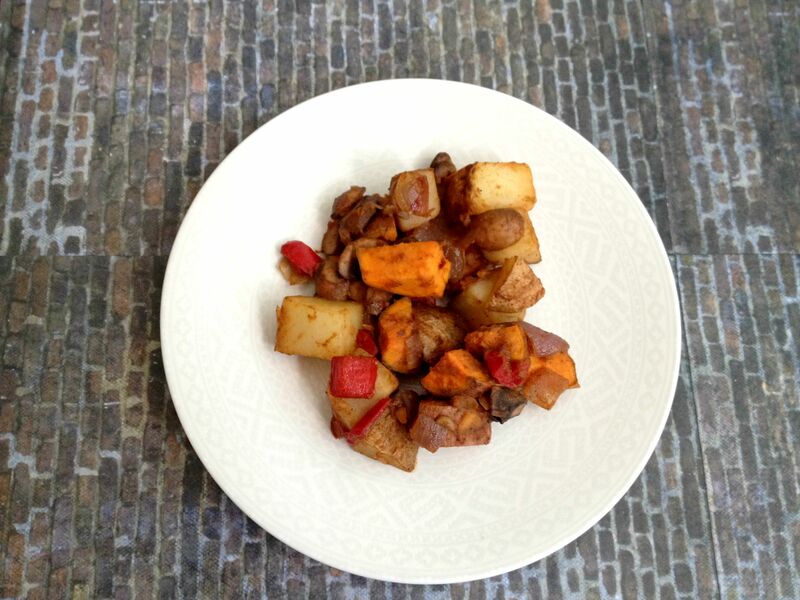 Hope you get to enjoy some vegan and gluten-free Mexi-Style Brunch Potatoes – which happen to be perfect for the Elimination Diet! I mean. Potatoes. There isn’t really anything you can do to ruin them. Even if they are burned just dip them in ketchup and they are awesome! But adding some spice and olive oil? 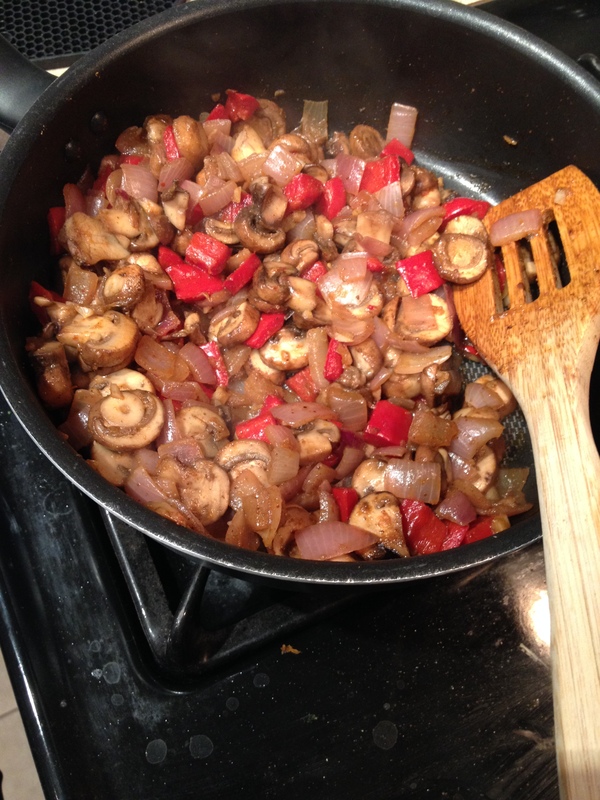 A little onion, pepper, and mushrooms. Good. Ness. You can’t get any better. 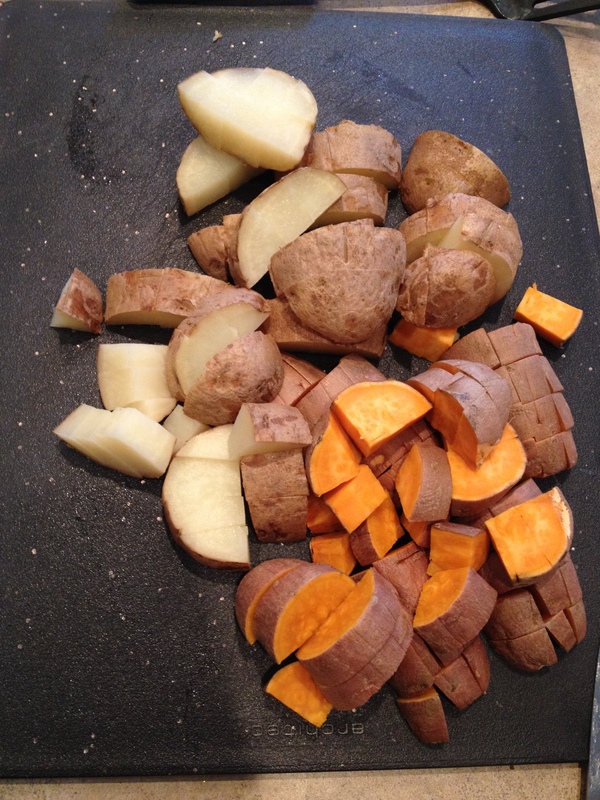 So these are the potatoes I posted about in my mid-August Elimination Diet update. The potatoes that caused a slight gain? Yes – these are awesome, so don’t go eating the whole pan at one time. Because even when you cut everything possible from your diet … you can still overeat. Don’t let anyone tell you that you can’t. You can eat fruit and veggies all day, but it will come back to get you in the gain department. This elimination diet has been what my mind needed in that sense. Yes, I can enjoy mock-fried potatoes but I need to remember that I don’t have to eat the whole pan. I can save some for later. I have to say that I am so glad for this Elimination Diet. And for clean eating potatoes. Because I call these mock-fried but there is really no frying. Just a little olive oil and let the pan do the rest. The veggies just get a sauteed in the mushroom liquid and a little oil. 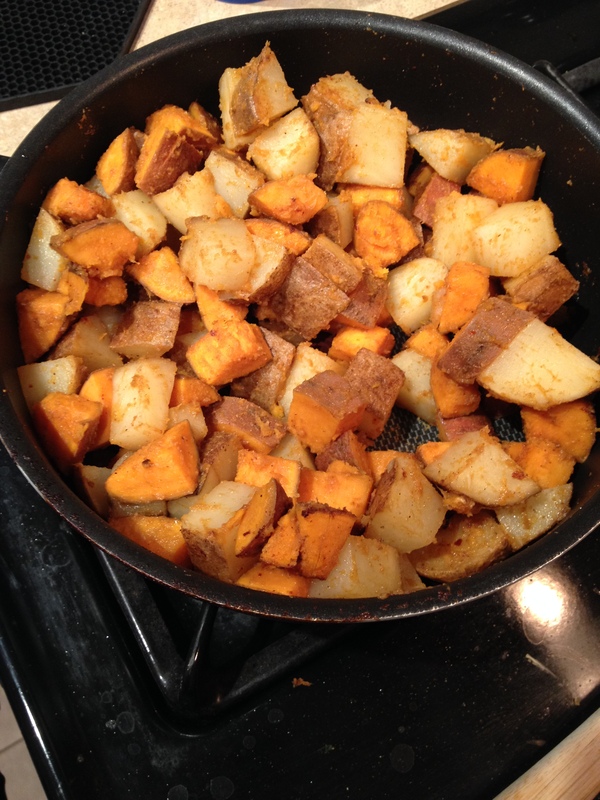 The potatoes get a little slick from the oil then the pan just browns those taters up! Start by washing and scrubbing your potatoes then poking holes all around them. The easiest and best way to do any type of cooking of potatoes in a pan is to microwave them first until they are fork tender. If you just chopped up potatoes and then tossed them in the pan? An hour in front of that pan and tons of oil later … you smell like fried food. Yuck. I hate that smell. 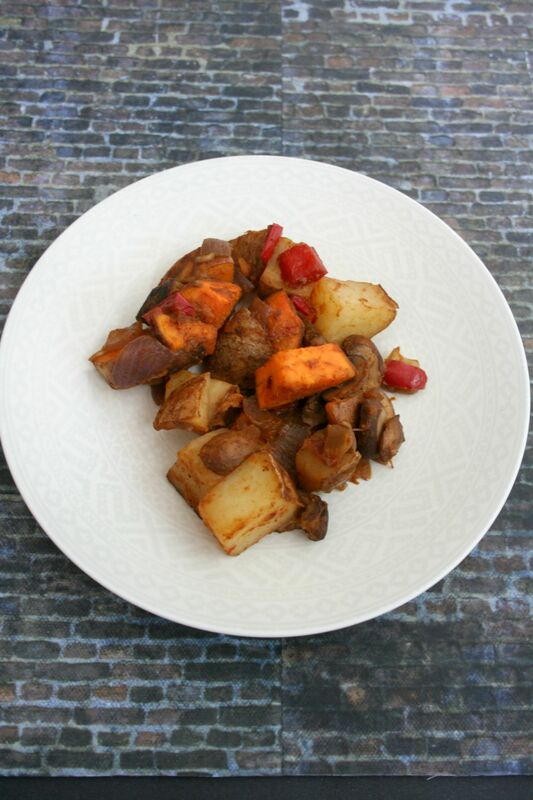 Microwave those potatoes until fork tender then wait until they are cool enough to handle and chop them into medium-size chunks and set aside. 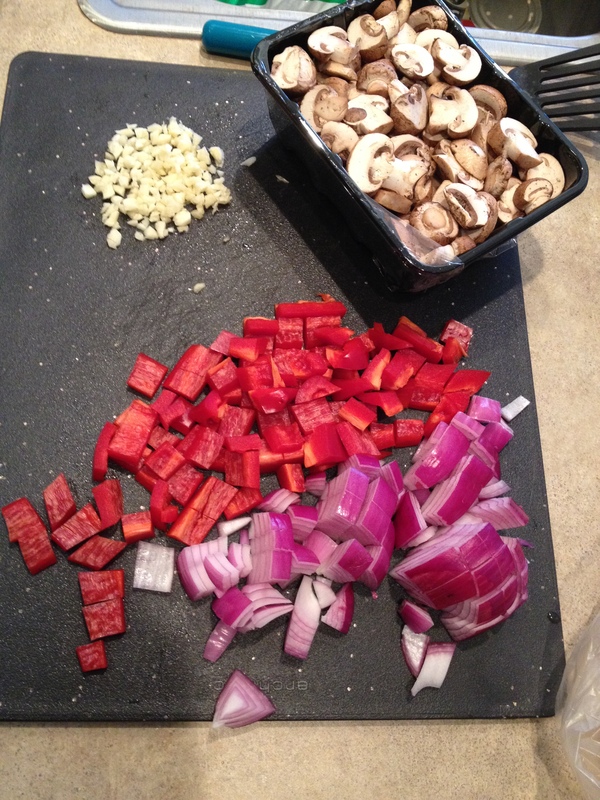 While tato’s are cooking mince the garlic, chop the onion and pepper, and rinse the sliced mushrooms – don’t cut the mushrooms they are awesome sliced as is in this dish. In a large saute pan add one tablespoon oil then add all veggies then over and sweat out liquid. 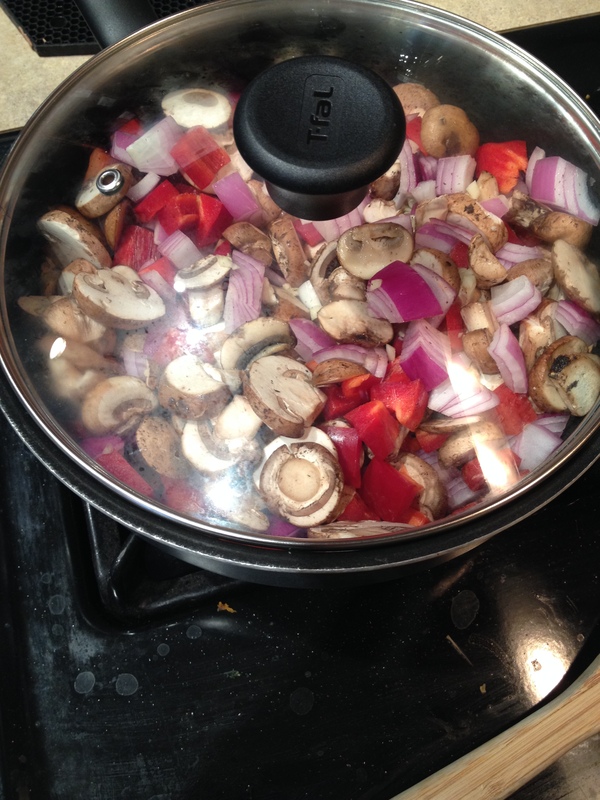 Take lid off then add two teaspoons seasoning and saute until liquid is gone and mushrooms just tender. Dump in large bowl then add one tablespoons oil to pan, add chopped potatoes and one teaspoon seasoning and cook over medium heat until browned. Add to bowl and mix. Spoon up and enjoy! 1. Wash and scrub potatoes then poke holes throughout. Bake in microwave until fork tender. Let cool enough to handle then cut into small to medium-size chunks. 2. Chop onion and pepper and mince garlic. Rinse mushrooms. 3. 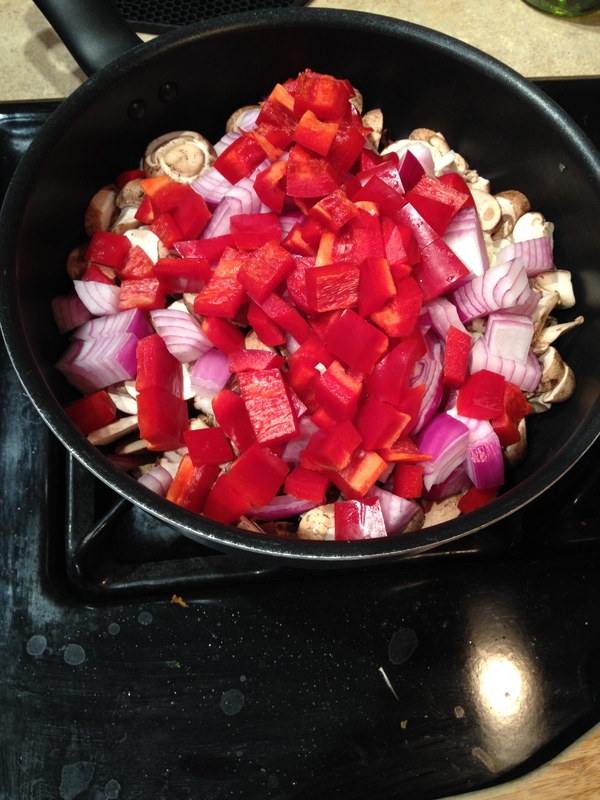 Add one tablespoon olive oil to a large saute pan then add all veggies. 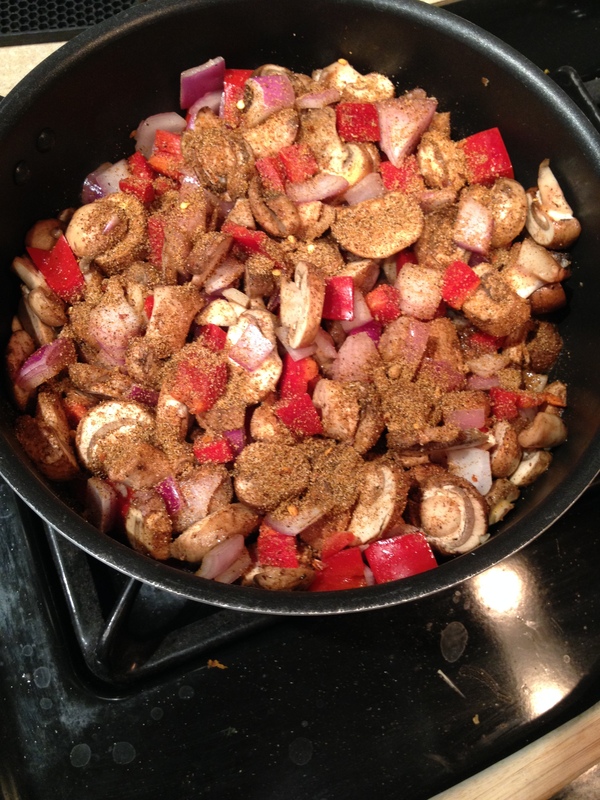 Mix then put lid on to pull liquid out of mushrooms – about 5 minutes. 4. 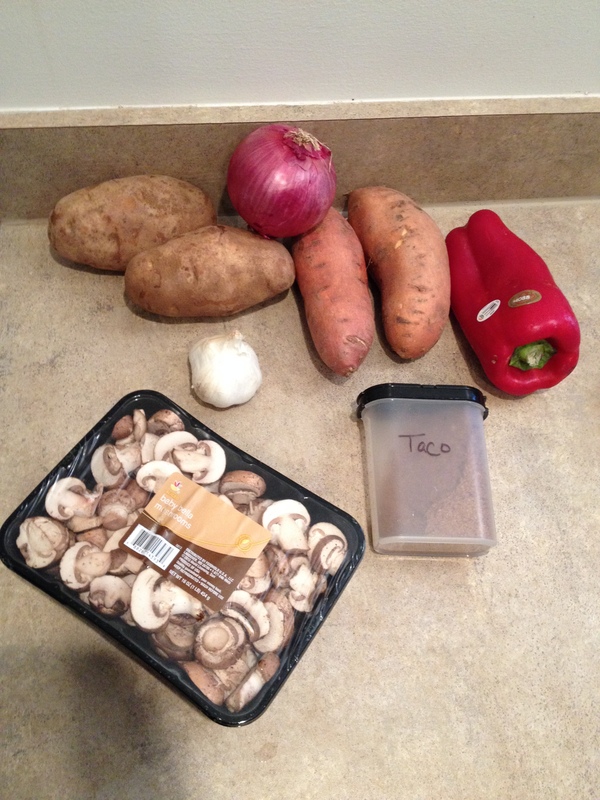 Take lid off then add two teaspoons taco seasoning to veggies and saute until mushrooms are just tender and liquid gone. Pour into a large bowl. 5. 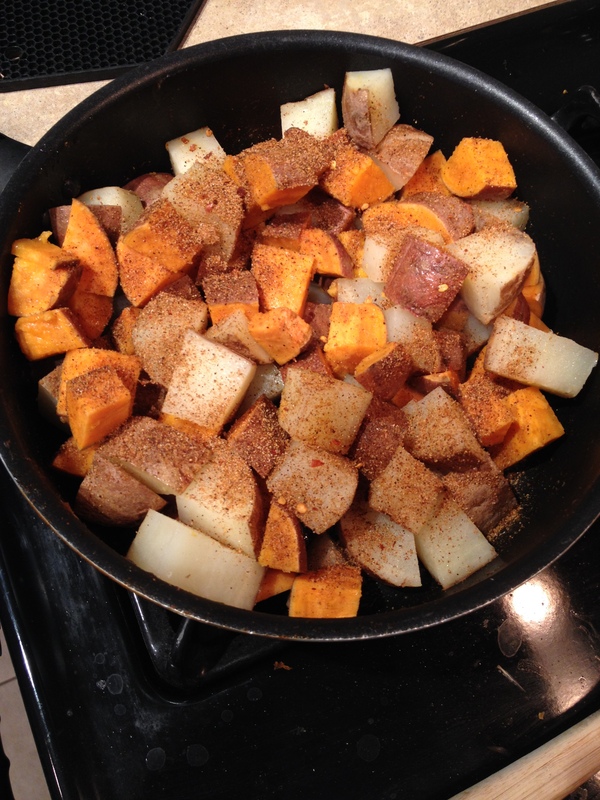 Add one tablespoon oil to saute pan and place on medium heat then add potatoes and one teaspoon taco seasoning. Saute potatoes until brown. 6. Add to veggies and mix. 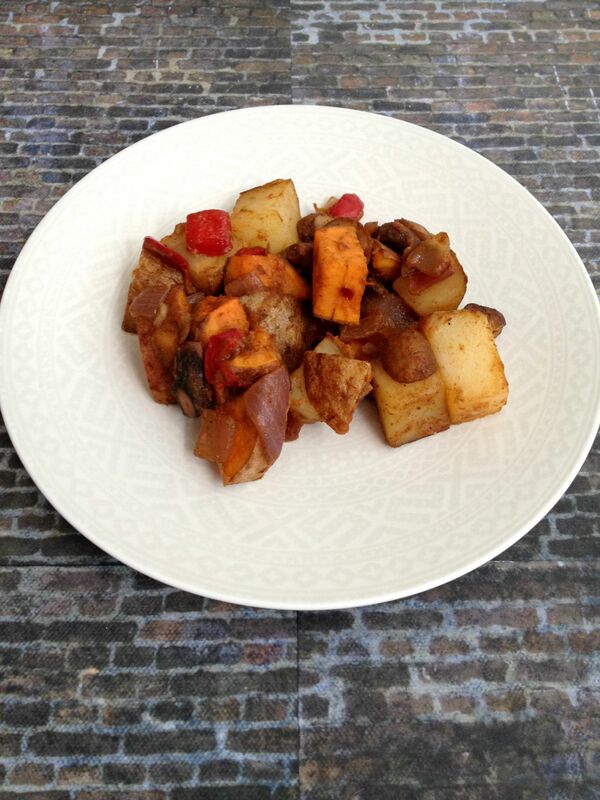 This is the perfect way to spice up your breakfast and you can use any veggies!